Addison Reed had 40 saves and a 3.79 ERA for the White Sox last season. PHOENIX — The Diamondbacks and White Sox front offices got to know each other well in conversations regarding pitchers Jake Peavy and Chris Sale over the last six months, and that helped facilitate a second deal between the two teams in the last week. The D-backs acquired closer Addison Reed for third baseman Matt Davidson on Monday, adding to their bullpen depth while trading a player who showed promise in a September callup but was blocked at third base by Martin Prado. There seems little doubt that Reed, who has 69 saves in the last two years, was added to close, even if general manager Kevin Towers hedged slightly. "He’s going to get every opportunity," Towers said. "We had some issues last year. We’re going to go with the best guy. If that is Addison Reed when spring training ends, he will be our closer." That leaves one major item left on the D-backs’ off-season wish list, a No. 1 or No. 2 starting pitcher, and with the trade of an asset like Davidson, it appears almost certain the D-backs will turn to free agency to get that done. Towers also has been in contact with Eric Chavez’s camp and said he hopes to know whether Chavez will be back before the holiday break. The D-backs were linked to Japanese star Masahiro Tanaka and major league free agents Matt Garza and Ervin Santana at the winter meetings. Japanese league team Rakuten has not decided whether to "post" Tanaka, which would make him available to any major team willing to put up the $20 million fee. While some free agents, Garza and Santana among them, are said to be asking for a five-year contracts, the D-backs are not likely to go that far. "A lot depends on who the pitcher is. We are more cautious when it comes to terms rather than dollars," Towers said. "More than three years, I don’t think we’re comfortable going there." Reed, who closed for Stephen Strasburg at San Diego State, makes no bones about wanting to stay in the role he had for the past 1 1/2 seasons with the White Sox. A southern California native, Reed said watching Troy Percival finish games with the Los Angeles Angels was a strong motivator. "I love it," said Reed, who turns 25 on Dec. 27. "It’s the only thing I dreamed of, the only thing I wanted to do. Hopefully I can be a closer until my last pitch." At the same time, Reed said he is taking nothing for granted as he enters a bullpen full of pitchers who have filled the closer’s role — J.J. Putz, David Hernandez and Brad Ziegler. "I’m going into spring training trying to do everything can to see that the ninth inning belongs to me. I want to make that decision difficult," he said. Towers retooled the D-backs’ bullpen to good effect before the 2011 season, and the addition of Reed is the latest move this winter designed to help a bullpen that was tied for the major league lead with 29 failed save conversions and gave up an NL-high 59 homers in 2013. Heath Bell was trade to Tampa Bay two weeks ago, and hard-throwing right-hander Marco Mateo was selected in the Rule 5 draft Thursday. 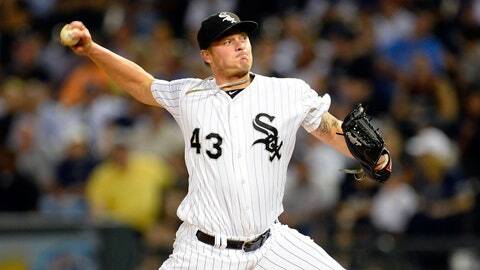 Reed was 5-4 with 40 saves and a 3.79 ERA in 68 appearances with the White Sox last season. He was 3-2 with 29 saves and a 4.75 ERA in his first full season (2012), taking over the closer’s job two months in the season. He was seventh in the majors in saves last season, when he had eight failed conversions. A third-round draft pick in 2010, Reed is under control for the next four seasons. The White Sox approached the D-backs about Reed, Towers said. "I didn’t think that he would be available. We didn’t see a direct match with them," said Towers, adding that when Reed’s name was mentioned, he immediately was interested. The D-backs have made two trades with the White Sox in eight days. They sent center fielder Adam Eaton to them in the three-team deal in which they netted Mark Trumbo from the Angels for left-hander Tyler Skaggs. It seems likely that both Eaton and Davidson will start for the Sox this season. Davidson, 22, hit .237 with six doubles and three homers in 76 at-bats with the D-backs last season after making his major league debut in August. A sandwich pick in the 2009 draft, Davidson averaged 33 doubles, 19 homers and 85 RBI in his four full minor league seasons. But the D-backs felt comfortable including him in the Reed deal because of their depth at third base. Jake Lamb played well in the Arizona Fall League, and Brandon Drury led minor league baseball 51 doubles at Class-A South Bend. With the addition to Trumbo to play left field, Davidson was squeezed out of a chance to play third base, which belongs to Prado. Trumbo, A.J. Pollock and Gerardo Parra are the starting outfielders, with Cody Ross added to the group when he returns in April or May.